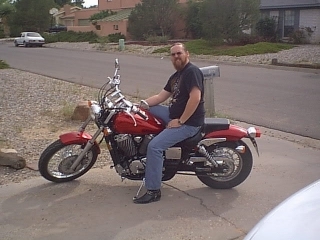 Honda Shadow Forums : Shadow Motorcycle Forum > Motorcycle Discussion > Technical Discussion > ignition module... bypass? so... I've got this 96 vt1100. it wouldn't start. lights came on hit the start button, lights go dim but no cranking. I then replaced the battery thinking it was just too weak. it was not the battery. with the new battery installed i turned on the key and connected the + and - on the solenoid it cranked slow for a while then turned over. it idles just fine. so i think the ignition module is shot. can i just bypass it or does it control way more stuff? If it idles it has spark, that is the main job of the ignition unit. Give more detail of how it runs. Maybe you are saying it doesn't crank when it should. Then it may be the ignition switch or start switch contacts or the ground circuit for the solenoid such as the kickstand switch, clutch switch, etc. I go about starting the bike like normal. It's in neutral, kickstand is up the kickstand light is off. Hit start while the kill switch is in run. The lights dim and nothing else happens. If I manually make the connection between the points on the solenoid it starts up and idles like normal. If I give it some gas it starts to sound off tho. Out of rythm. Definitely sounds like your start switch. Open the clam shell and look at the contacts. I agree with @jpr1968 , and suggest checking the start switch. It's got small copper contacts inside it, and when you push the button to start, it slides to make contact, completing the circuit. If that's either missing the contacts or has a wire broken to it, you'll see exactly what you have, lights dim, no crank, no start. Had mine go out on me at a local MC rally a few hours from home, with a wire that broke off. I managed to get the bike working using a bandaid, of all things, to hold the wire to the switch so it would start and run fine, and got me home, but I didn't get a chance to resolder it until the next weekend, and rode it all week to work with that bandaid holding it together. Soooooo.... It was the solenoid. It was the only thing that wasn't doing what it was supposed to be doing and I really should have noticed sooner. Had to have a buddy come over and put fresh eyes on it but she fires right up again! Thanks for the help though guys. I really appreciate it!